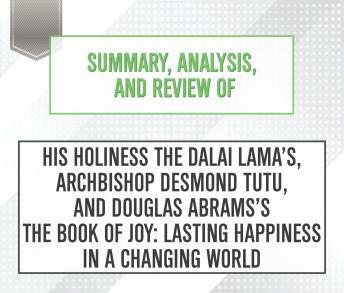 Summary, Analysis, and Review of His Holiness the Dalai Lama's, Archbishop Desmond Tutu, and Douglas Abrams's The Book of Joy: Lasting Happiness in a Changing World PLEASE NOTE: This is a key takeaways and analysis of the book and NOT the original book. Start Publishing Notes' Summary, Analysis, and Review of His Holiness the Dalai Lama's, Archbishop Desmond Tutu, and Douglas Abrams's The Book of Joy: Lasting Happiness in a Changing World includes a summary of the book, review, analysis & key takeaways, and a detailed About the Author section. PREVIEW: The Book of Joy is an account of a meeting in India between the Dalai Lama and Archbishop Desmond Tutu in early July 2015 to celebrate the Dalai Lama's 80th birthday. Tutu and the Dalai Lama engaged in a series of dialogues about the meaning of joy and how to achieve it. This book details their ideas and their friendship. It also discusses scientific research into joy and happiness in order to confirm and expand on their insights.